Find incredible Sapphire and Sapphire diamond rings here at Gracious Rose Jewelers. We're always adding exciting new styles and are able to create many custom designs just drop us an email with your ideas or call us, we're happy to help. You'll find beautiful colors in our gemstone jewelry and precious metals including 14k gold, 18kt gold, 14k rose gold, and Platinum. Pretty 14k White gold features a 4mm round center genuine blue Sapphire and a diamond accented border totaling .06ctw. Pretty little ring for anytime, great pinky ring. Pretty Pink Sapphire and diamond ring. Shown in 14k White gold this ring design is available in 14k yellow, 18kt, and Platinum choices. 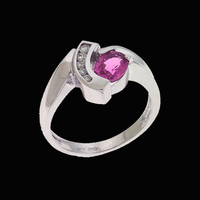 Genuine Pink Sapphire is a 1.06ctw stone, accent diamonds total .12ct tw and are SI 1 clarity G in color.